Yesterday I looked in the freezer and realized that we had lots and lots of tomatoes from our garden last year. So I made some yummy vegetable soup with some of the frozen tomatoes. This recipe originally came from Weight Watchers, but I have modified it slightly to make it yummier (in my opinion). I have made this soup many times, but always in my milchig (dairy) dishes. This time, however, I wanted to make the soup pareve so that it could be eaten with either meat or dairy meals. (There are some people in this household who do occasionally eat meat.) Because the soup doesn't actually contain any meat or dairy products, all this means is that I made it in a pareve pot -- one that has never been used for either meat or dairy. And I used knives and cutting boards that are kept pareve instead of those that have probably been used for cheese and other dairy products. 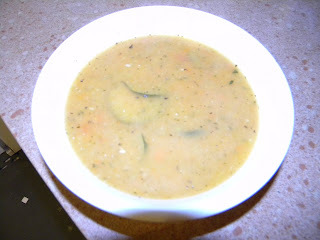 The full recipe for the soup appears at the end of this post. The pictures are for your enjoyment! First of all, I chopped a couple of onions and a bunch of garlic and set them to saute in a small amount of oil with some seasoning. I stirred frequently and added small amounts of water if the onions looked like they were about to stick to the bottom of the pot. 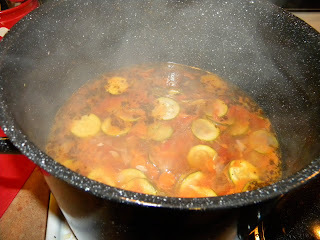 Once the garlic and onions were nice and soft, I added the zucchini and carrots, along with a quart of frozen tomatoes to the pot. At this point, I added 4 quarts of water, some basil and freshly-ground pepper, and brought the soup to a boil. 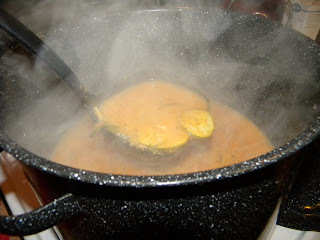 Once it boiled, I covered the soup and reduced the heat so that it could simmer for about half an hour. 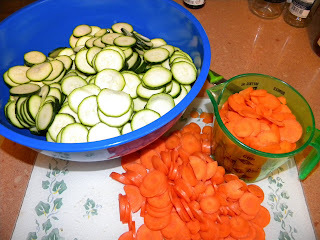 After the vegetables were all cooked, I removed some of the cooked vegetables from the pot and set them aside. And then I blended the soup that was still in the pot. Usually, I would use a blender or food processor for this step, but I don't happen to own either piece of equipment that is pareve. 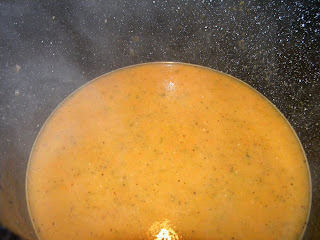 I do, however, have a pareve immersion blender, so I used that to puree the soup. The reserved vegetables got added back in and the soup was done! Saute onions and garlic in oil with soup mix. Cover and cook over low heat, stirring occasionally for about 10-15 minutes or until the vegetables are starting to get soft. Add 4 cups water; bring to a boil. Reduce heat, cover, and cook for about 30 minutes. 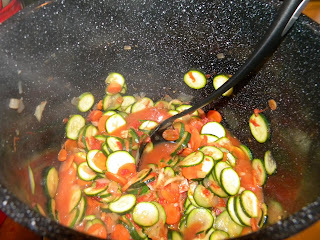 At the end, the vegetables should be soft and look cooked. 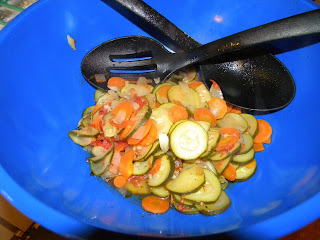 Remove 1 cup of the vegetables with a slotted spoon and set aside. 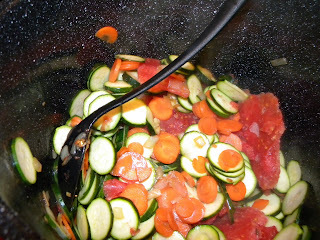 Puree remaining soup, then add reserved vegetables. Serve hot. Add salt to taste. *Onion soup mix. I used to use Carmel Onion Soup powder, but haven't been able to find it in years. I used Lipton's Onion Soup Mix today and it worked out fine. 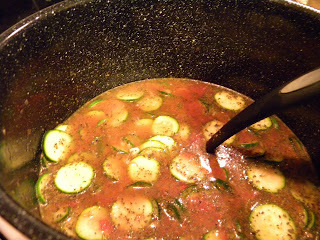 ** I have used canned tomatoes as well as fresh tomatoes in this soup.